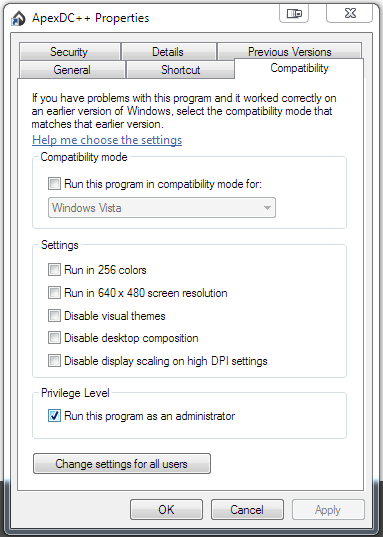 If you are a new user, make sure to click the checkbox to install ApexDC++ along with Dtella. If you are an existing user, the included ApexDC++ installation is optional, but note that it is preconfigured to work with Dtella. Dtella is the ‘hub’ that allows you to connect to other users on campus. This application is invisible and runs silently in the background of your computer. Alone, this will do nothing. ApexDC++ is the program you run to connect through the Dtella program. This allows you to share, view, and download files from any other connected user across campus. Run Dtella first, then start this program. Video on doing this process. 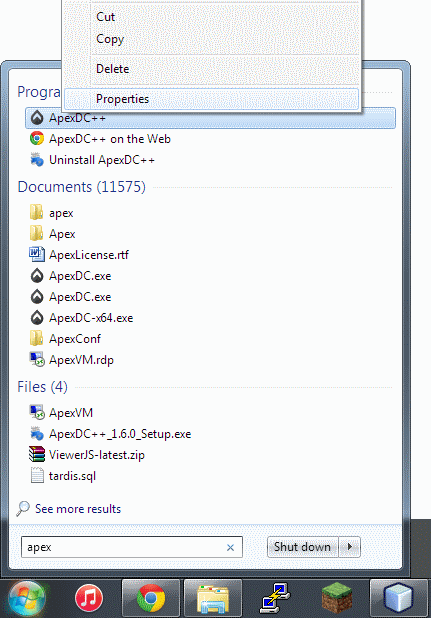 Go to ApexDC++ shortcut that you use (Either on Desktop or Program Files in Start Menu) and Right click the shortcut. Select Properties.